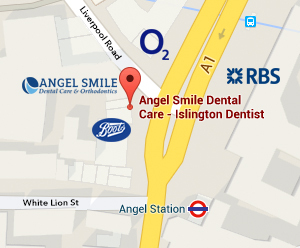 Please call 02078373938 or send email to: reception@angelsmile.co.uk with your full name, contact number and address. Please specify your request for an appointment if you wish to have a general check of your teeth and gums or looking for a specific service like Implant, Invisalign, whitening, smile design and make over, Braces, direct access to hygienist session etc. You also may specify that you wish an appointment with preferred Dentist, Hygienist, Specialist Orthodontist or Specialist Periodontist. If you are new to our practice welcome, you may fill the form (please visit the New Patient page) now or you will receive this anyway when you attend practice. You could visit us at on the first floor, 41 Islington High Street,Islington, London, N1 9LH to book your appointment by person. It is the aim of our team to provide quality dental care to you and our other clients on schedule and to use clinical time effectively. Please help us in this matter. We understand that unplanned issues can come up and you may need to cancel or reschedule an appointment. Short notice cancellations, failed attendances or late arrivals are disruptive to the care of other clients. Should you need to cancel or reschedule your appointment, we ask that you kindly notify us giving at least 24 hours notice for 30 Min appointments and 48 hours for any appointment over 30 Minutes, so that another patient may be offered this appointment. There will not be a cancellation charge in this circumstance. Cancellations should be made by email to: reception@angelsmile.co.uk or telephone on: 02078376965 or 02078373938. We regret that there will be a fee chargeable for missed, cancelled or rescheduled appointments within 24 hours (for 30 Minutes appointment) /48 hours notice (for appointments over 30 Minutes). This fee is a minimum, which covers part of the cost of a modern clinic made ready, reserved and waiting for you. The fee is based on the length of the appointment and currently is £45 per 30 Minutes. Refund of deposit out of 48 hours notice is per cheque and subject to 5% (Minimum of £5) administration and bank charges . If you cancel within 24 hours we still aim to give your time to other clients and if this happens we won’t charge you. We also aim to telephone or write to you after a missed appointment to understand the reason for non-attendance. Any complain about missed or cancelled appointment should be made in writing to Dr Amenien. We thank you for your understanding and cooperation. We do our best and look forward to see you all on time. Payment for your dental care by Cash or card.